i like Unicorns, fnaf, Roblox, Minecraft, and fortnite and more. I'm a girl. 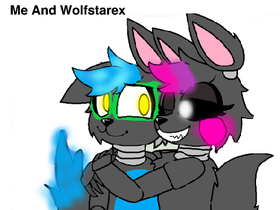 best friends on scratch are: wolfstarex, The_Mangle07, wolfsrock2007, Firepup13, And ninja110207. Tash, Nolan, Scarlet, John, Jake, Spell, Wisey, Zack, Mercy (Spells Sister), Purple Girl, ZDFB, MoonStar, Oreo, And me and my brother.